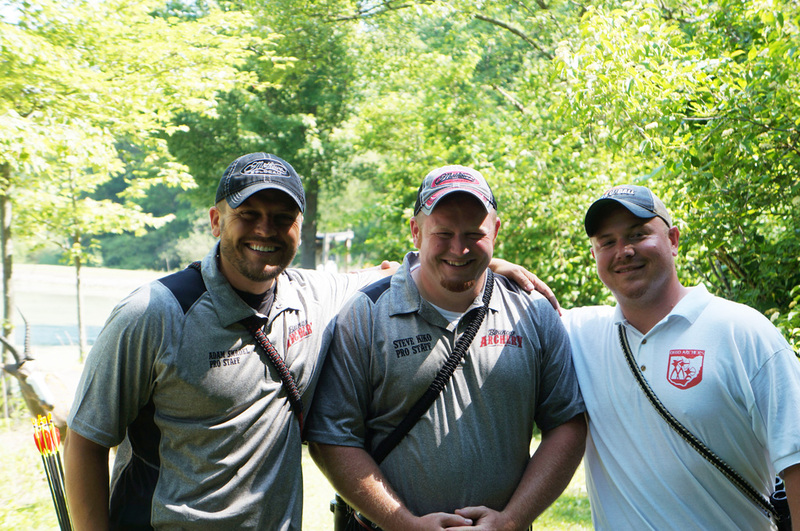 Dean Stebner, Barry Burnett, Gary Smith Sr. The following are four position shots, each arrow to be shot from a different position or at a different target: 35 yards at a 50 cm target, all from the same distance, but from different positions. Multiple targets may be used at all distances. The prescribed distances in this section are to be adhered to without variation. 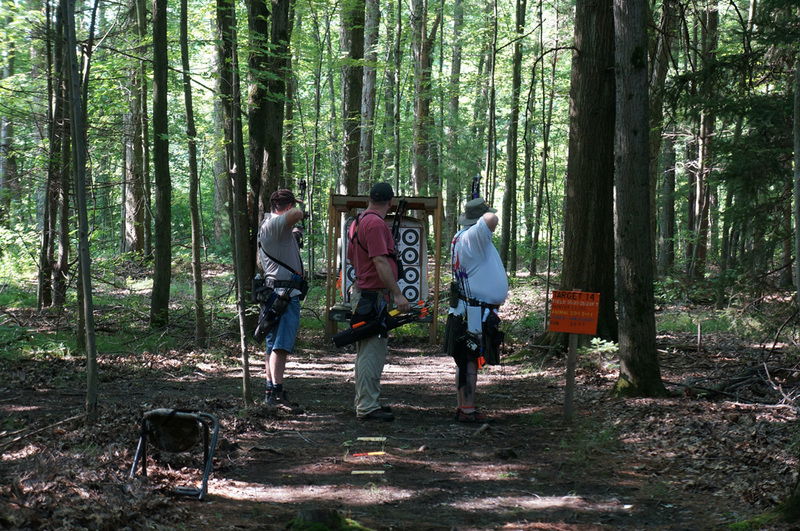 Each NFAA chartered club with an approved field course shall mark the distances on the shooting positions of all NFAA Rounds, except 3-D unmarked. In laying out the course any order may be used as necessary to fit the terrain. Each archer shall shoot 4 arrows at each of the 14-target layouts in a unit. In 10 cases this shall mean shooting the four arrows from a single stake at a single target. In the other four it may mean either shooting one arrow from each of four stakes at a single target or it may mean shooting all four arrows from a single stake but at four separate targets, or one arrow from each of four stakes at either two (2) or four (4) targets. The scoring is 5 points for the spot, 4 for two white circles and 3 for the outside black rings. In all NFAA Rounds, an arrow shaft need only touch the line to be counted in the area of next higher value. In non-Professional Divisions, the X-Ring is used for tiebreakers only as determined by the Tournament Chairman. In all Professional Divisions, scoring is 1 bonus point for the X (total 6), five points for the spot, four for the two white rings, and three points for the outside black rings. Archers will track X's in a separate column, i.e., 20 with 3X which will carry over to a final column and would be totaled as 23. The scoring is five points for the spot, four for the second circle, three points for the third circle, two points for the fourth circle and one point for the fifth circle. The x-ring is used for tie breakers only. The 14 targets form a unit. Twice around the unit makes a round, or two such units make a round. The target has two white rings with black X in center ring, and two outside black rings. (X• ring is used for tie breakers only). 20 cm. targets will be shot vertically either from bottom to top in order or top to bottom in order. Where one stake is used, a stake at least eighteen inches above ground is recommended. On the two-stake shots use stakes that extend twelve inches above ground and stakes that are not over six inches above ground for the four-stake shots. 1 stake- Shoot four arrows from the same stake. 2 stakes - Shoot two arrows from each stake. 4 stakes - Shoot one arrow from each stake. Any arrow shot from the wrong stake will be scored "0" (zero). Scoring is five points for the spot, four for center ring, and three for the outer ring. In non-Professional Divisions, the X ring is used for tiebreakers only as determined by the Tournament Chairman. In all Professional Divisions, scoring is 1 bonus point for the X (total 6), five points for the spot, four for center ring, and three for the outer rings. Archers will track X's in a separate column, i.e., 20 with 3X which will carry over to a final column and would be totaled as 23. The 14 targets form a unit. Twice around the unit makes a round or two such units laid out differently make a round. 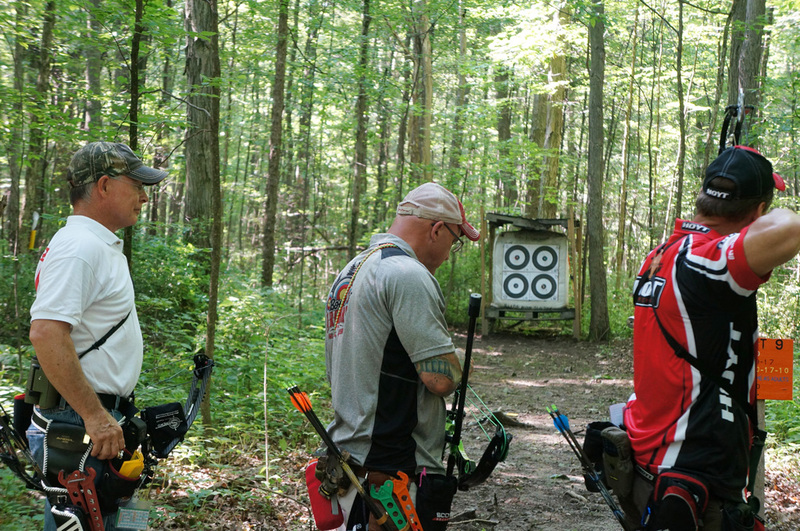 Once the maximum and minimum distances are known, then the target distance can be laid out anywhere within these distances and be according to NFAA rules. 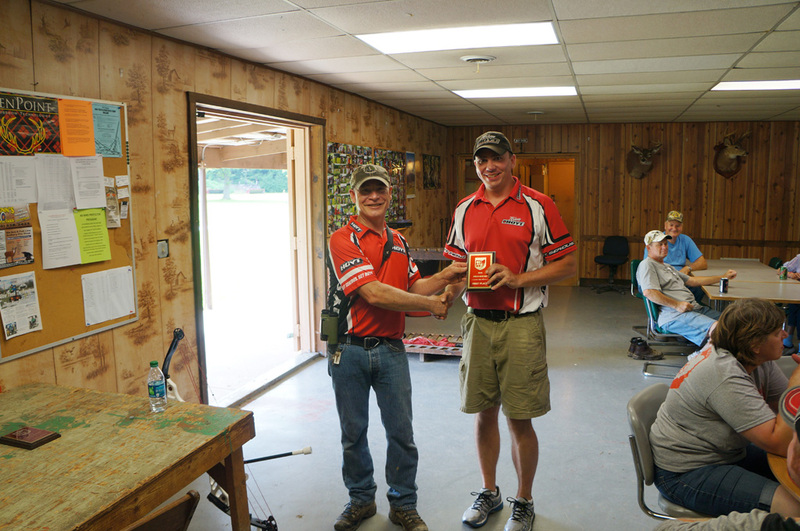 The targets for this round are animal targets with the scoring area divided into two parts. The high scoring area is oblong while the low scoring area is the area between the high scoring area and the "hide and hair" line or "feathers", as the case may be. The area between the "hide and hair" line to the outside of the carcass is considered a non-scoring area. A bonus dot (valued one point) is located in the middle of the high scoring area and colored white on dark targets and black on light targets. This bonus dot will be mandatory at NFAA National and Sectional Field Championships and optional at other events. An arrow shaft need only touch the scoring line to be counted in the next higher value. See Appendix 6 for a picture of an Animal Round Target. The high scoring area of Group No. 1 (plus or minus 1/8") is 8 ¾ inches wide by 14 ¼ inches long with rounded ends. Targets in this group are the black bear, grizzly bear, deer, moose, elk, and caribou. 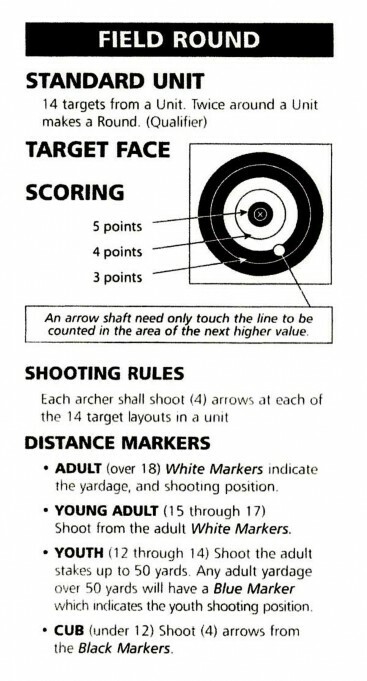 A bonus 6.5 cm dot (valued one point) is located in the middle of the high scoring area and colored white on dark targets and black on light targets. The high scoring area of Group No. 2 (plus or minus 1/8") is 6 ¾ inches wide by 10 ¼ inches long with rounded ends. Targets in this group are the small black bear, antelope, small deer, wolf, and mountain lion. A bonus 5 cm dot (valued one point) is located in the middle of the high scoring area and colored white on dark targets and black on light targets. The high scoring area of Group No. 3 (plus or minus 1/8") is 4 ¼ inches wide by 6 ¾ inches long with rounded ends. Targets in this group are the coyote, raccoon, javelina, turkey, fox, goose, wildcat, and pheasant. A bonus 3.5 cm dot (valued one point) is located in the middle of the high scoring area and colored white on dark targets and black on light targets. The high scoring area of Group No. 4 (plus or minus 1/8") is 2 inches wide by 3 3/8 inches long with rounded ends. Targets in this group are the turtle, duck, grouse, crow, skunk, woodchuck, jack rabbit, and rockchuck. A bonus 2 cm dot (valued one point) is located in the middle of the high scoring area and colored white on dark targets and black on light targets. 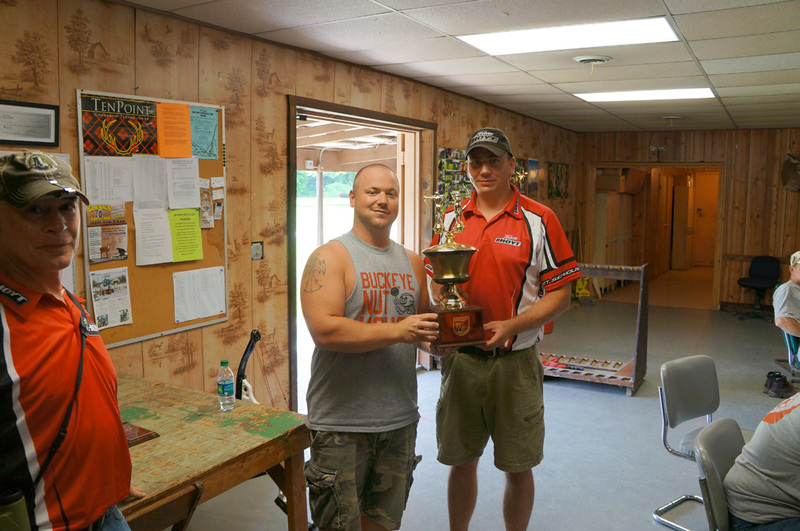 The shooting position shall be marked with its exact distance for the National and Sectional level tournament and may be marked at tournaments below that level. Each target in Group 1 is a five-yard walk-up. In a 14-target unit, there are three targets in this group. Select your distances between 60 and 40 yards for the first stake, move up five yards for the next stake and five more yards for the third stake. Each target in Group 2 is a three-yard walk-up. In a 14-target unit, there are three targets in this group. Select your distance between 45 and 30 yards for the first stake, move up three yards for the next stake and three more yards for last stake. Each target in Group 3 is one distance. In a 14-target unit, there are four targets in this group. All arrows shall be shot from the single stake at a distance selected between 35 and 20 yards. If two target faces are side-by side, the archer on the left shoots the left target. 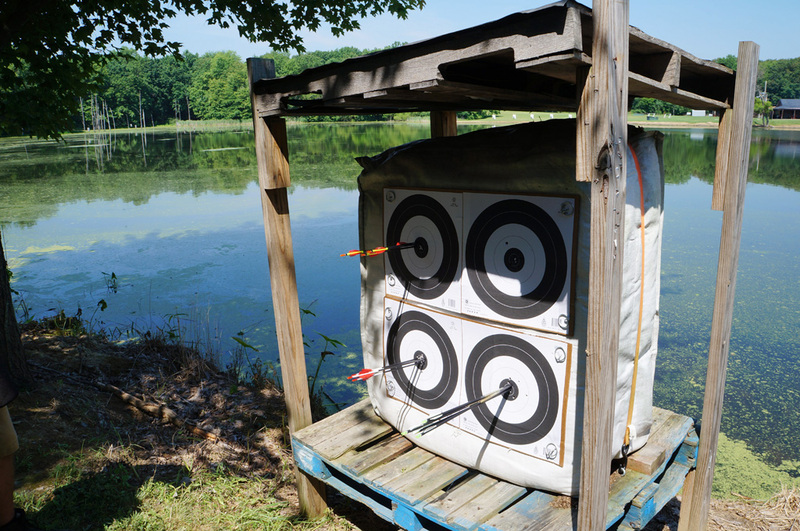 If two target faces are one above the other, the first two archers shoot the bottom target. Each target in Group 4 is one distance. In a 14-target unit, there are four targets in this group. All arrows shall be shot from the single stake at a distance selected between 20 yards and 10 yards. The first two archers shoot the bottom target faces, and the archer on the left shoots the left target. 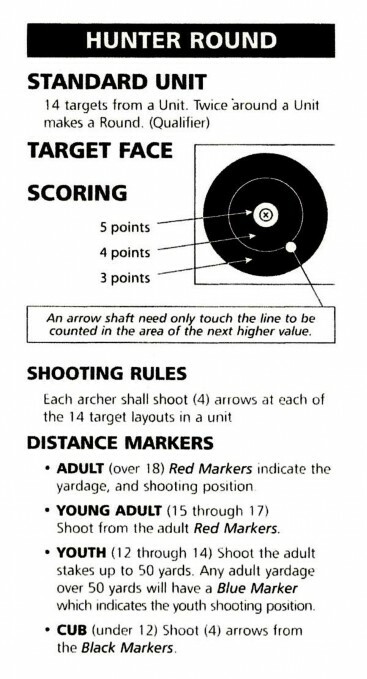 A maximum of three marked arrows may be shot, in successive order, and the highest scoring arrow will count. In the case of walk-up targets the first arrow must be shot from the farthest stake, the second arrow from the middle stake, and the third arrow from the nearest stake, in order to be scored. No archer shall advance to the target and then return to the stake to shoot again in the event of a missed arrow. 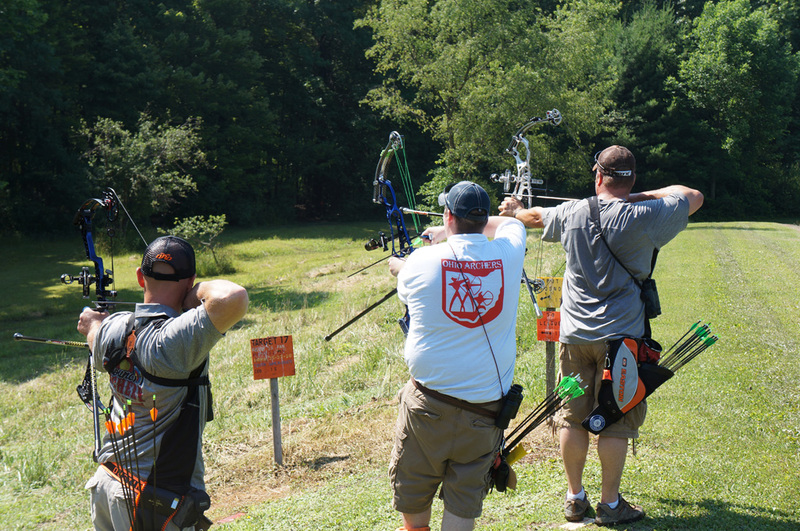 Rule clarification for all Bowhunter Classes: During the state field shoot, anyone shooting in a bowhunter class is allowed to move and/or change their sights between the Hunter Round and the Animal Round on day two. Once a round has started however, adjustments can no longer be made to the sight.